If you are looking for something special to add to your outdoor space this summer, then why not consider a Lutyens bench ?Benches are a great place to sit and enjoy your garden, and now you can do it on a charming and stylish Lutyens bench. With its high back and curved, rolled arms the Lutyens is one of the most attractive and increasingly popular garden benches around. One of the things that make this type of garden bench so popular is that it is more reminiscent of a sofa than a traditional garden seat; the bench derives its name from Sir Edmund Lutyens who designed the Thakenham bench. You will find the Lutyens bench in a range of Cuprinol garden colours or in unpainted wood, depending on your taste. Wooden benches are great garden favourites and come in a variety of shapes, styles and finishes. You will find Lutyens benches in two sizes, 150cm and 190cm. The teak Lutyens bench is made entirely of natural teak and is designed to age gracefully. You can have your garden bench engraved if you would like as a memorial or tribute to someone, engraving costs £59.95 and UK mainland delivery is charged at £15.99 on all Lutyens benches. The teak bench comes in both available sizes and costs £399.99 and £499.99 respectively. 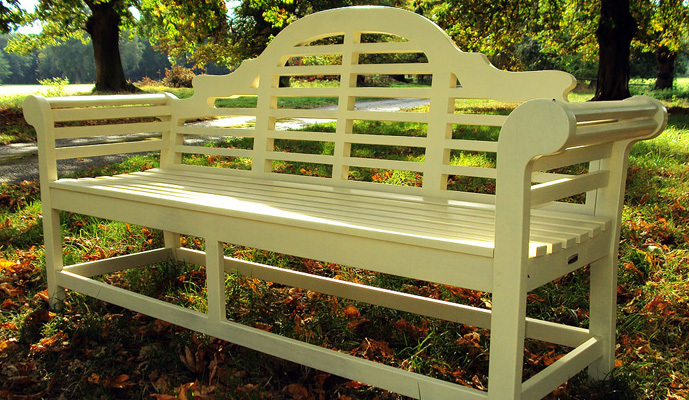 The elegant, Lutyens Ash garden bench comes in two sizes. The bench is constructed entirely of Ash hardwood and then painted with three coats to give a PU white finish. The Ash hardwood bench costs £299.99 and £399.99, respectively. The Lutyens painted teak bench is also built to last and to age gracefully. The teak bench is available in sizes 150cm and 190cm and is painted in a choice of Cuprinol garden colours. If you want some real garden style then this is the bench for you, the painted teak hardwood bench costs £449.99 and £549.99 depending on your size choice. Whether you are looking for a bench for your own garden, or you want one to grace a public space, the Lutyens bench is the ideal option.